Victoronix Swiss Army Original watch in green with "NATO" strap. Haberdash, a Chicago men’s boutique chain, continues to expand its empire like a Caesar in raw denim jeans. The latest flag the store has planted is Haberdash EDC, which stands for “every day carry.” In other words, accessories. Whereas the first two Haberdash stores focused on men’s clothing, this latest one carries shoes, grooming products, manly books, luggage and leather goods (and flannel goods) of all varieties. While there is no shortage of great gifts to purchase at Haberdash EDC — it carries an extensive collection of Malin + Goetz products, Wolverine boots and Goorin Bros. hats to name a few — our favorite is the Victorinox Swiss Army watch pictured above. We’ve never loved watches that try too hard to be different, especially when it comes to color. But by using an earth tone like military green, this watch — part of Victorinox’s Original line — manages the difficult task of looking both unique and understated. And it fits in perfectly with the ever-present rugged chic trend that shows no sign of slowing down. The strap is nylon, the bezel aluminum, the movement quartz. And if you’re amphibious or just adventurous, the watch is water resistant up to 100 meters. 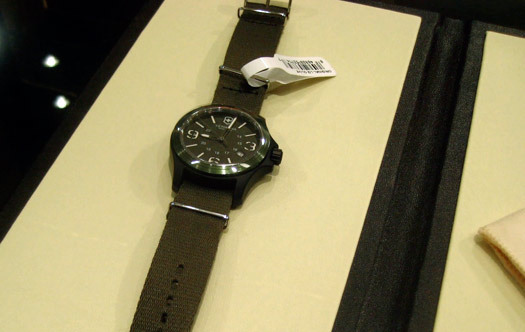 At $295, the military green Original is a pretty reasonably priced, at least for timepieces. In the under-$1,000-watch category, we think Victorinox Swiss Army is one of the better brands you can choose. Our only complaint with the aforementioned timepiece collection: spare straps don’t appear to be available for sale. Yes, the green on green makes for a handsome and robust look, but it’d be nice to have the option swap out the green strap for a black, gray or khaki one. It’s good to have options. It’s even better to have some contrast. Want to see more photos from Haberdash EDC? Check out the new Man Up Chicago Facebook page.